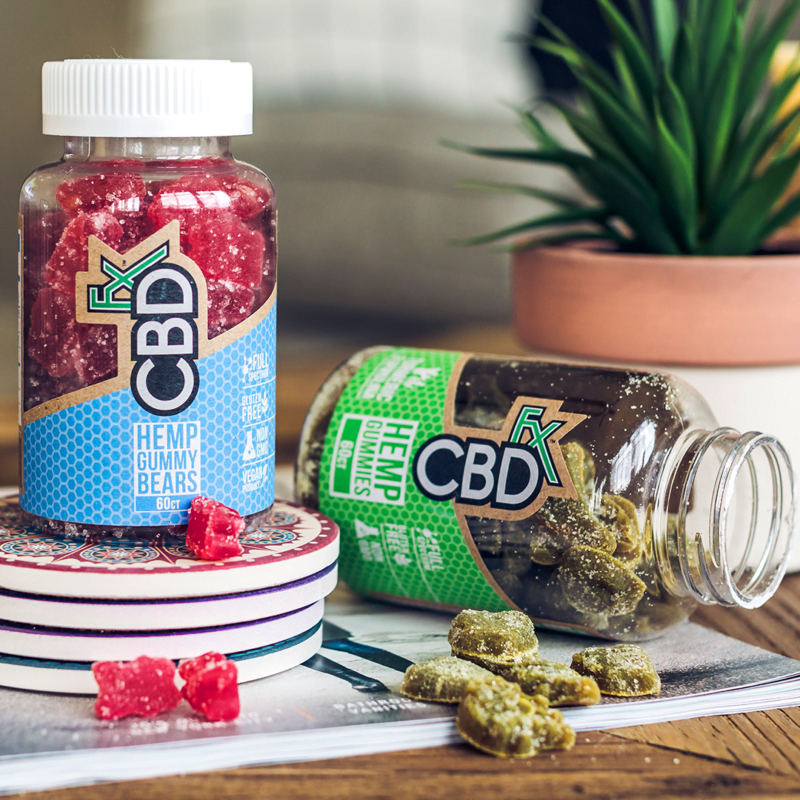 Our CBD gummies are more popular than ever, and our customers always want to learn more about these high-quality, fully vegan CBD products. To make it easier to familiarize yourself with all the details on our top-selling organic CBD gummies, we’ve put together answers to some of the questions that customers ask us most frequently about these potent and convenient vegan CBD solutions. 1. What Are CBD Gummies? 2. Are Vegan CBD Gummies Available? 3. What Are Full-Spectrum CBD Gummies? 4. What Makes CBDFx Gummies Unique? 5. What Are the Benefits of Organic CBD Gummies? 6. Who Can Use Hemp Gummy Bears? 7. Where Can You Buy CBD Gummies? 8. Why Do Some of Your CBD Gummies Include Turmeric and Spirulina? 9. Are Your Vegan CBD Edibles Lab Tested? 10. How Do You Pick the Best CBD Gummies? While CBD gummies might look just like your average gummy bears, they are very different from normal gummy bears on the inside. Normal gummy bears don’t have cannabidiol (CBD) as their active ingredient — but ours do, and thousands of people around the country have reported a litany of positive anecdotal results from using these full-spectrum CBD gummies. Each of our CBDFx gummies contains 5mg of CBD, and these gummies feature light flavoring that makes them taste just like your favorite candy. However, the ingredients in our hemp gummy bears are better for you than the artificial ingredients in most gummy bears: our gummies contain organic cane sugar and organic honey, and they only contain natural flavors and coloring. Our organic CBD gummies are perfect for any occasion, and you can use them for anything that you use other CBD products for. Plus, our gummies come in 8-count pouches and 60-count bottles for your convenience. If you don’t like using animal products, you’ll be happy to learn that our CBD gummies are 100 percent vegan. That’s right; these vegan CBD edibles don’t contain any ingredients derived from animals, and we also don’t test any of our products on animals. While other CBD edibles might contain ingredients that you aren’t comfortable eating as a vegan, you can rest assured that you’ll never be asked to compromise on your values when you choose to use CBDFx gummies for all of your CBD needs. Keep in mind that almost all of our other CBD products are vegan as well. There are two types of CBD on the market today: full-spectrum and isolate. CBD isolate has been subjected to a number of processes that strip it of all the beneficial compounds that are naturally occurring in CBD oil. What’s left is pure CBD that usually takes on a powder or crystal form. Full-spectrum CBD, on the other hand, has all the natural components of hemp oil intact. Increasingly, researchers believe that CBD isn’t meant to work in a vacuum; the other compounds present in CBD-rich hemp oil are designed by nature to improve the effectiveness of this cannabinoid. It’s a case of “two plus two equals five,” so to speak. The sum of the ingredients is greater than the parts alone! An Israeli study found that full-spectrum CBD is more effective than isolate CBD. When human subjects use isolate CBD, they encounter a bell curve; at a certain dosage, isolate CBD stops being effective, and it actually becomes less effective. With full-spectrum CBD, however, there is no such bell curve. Not only is full-spectrum CBD believed to be more effective due to the synergy between CBD and other cannabinoids and terpenes, but this type of CBD stays just as effective at high doses. Our CBD hemp oil is extracted from the absolute best organic hemp that our partner European farms have to offer, which means that there are no harmful pesticides or harsh chemical fertilizers in our CBD. We extract our CBD with CO2 to ensure that no solvents are left behind in our organic CBD oil. Our CBD gummies only have natural sweeteners, colorings, and flavors. They do not contain corn syrup, animal gelatin, or artificial sweeteners. Our CBD gummies do not have any ingredients derived from animals, and we never test our products on animals. Natural full-spectrum CBD is increasingly thought to be more effective than isolate CBD. We stand by our products 100 percent. If you ever have any problems with our vegan CBD gummies, we won’t rest until we find a solution. We lab test every batch of our hemp gummy bears to make sure that they follow our strict quality standards. For your convenience, our CBD gummy bears come in two different package sizes. Our 8-count CBD gummy pouch is easy to take with you wherever you go, and it fits perfectly into your backpack or the glove compartment of your car. Our 60-count CBD bottle is great for keeping at home or at work for easy access to CBD whenever you need it. We take the quality of our hemp gummy bears very seriously here at CBDFx, and we only use the best ingredients to make these vegan CBD edibles. Plus, we rigorously test each batch of our gummies, and our lab results are posted publicly for everyone to see. Our customers tell us that our vegan CBD products are amazingly effective for a wide range of conditions. For instance, Oksana S says that our hemp gummy bears help her with hip pain, Jacqueline M says that our gummies help her sleep at night, and Denise C says that these convenient CBD gummies help her with anxiety. Customers like Jennifer A have even reached out to us to say that our organic CBD gummies relieved their chronic pain in 15 minutes or less. Each CBDFx gummy is packed with 5mg of organic full-spectrum CBD, which means that there are 300mg of CBD in each bottle that fits perfectly in your medicine cabinet or on your bedside table. Reach for a potent CBD gummy whenever you have the urge to indulge in the benefits of CBD. Anyone can use our convenient and tasty full-spectrum CBD gummies. These vegan CBD edibles are just like normal gummy bears, which makes them a hit. Whether you’re looking to try a natural remedy to ease symptoms of epilepsy, arthritis, neuropathic pain, diabetes, or any other condition, you can use our CBD gummies before bed, with breakfast, at work, or anywhere else at any time of the day. People love how easy it is to take our CBD gummy pouches with them, and you should leave a bottle of our CBD gummies on your counter for whenever you feel the need for a 5mg dose of organic CBD. Since our hemp gummy bears aren’t psychoactive, you can use them at any time without having to worry about feeling high or experiencing any other psychological effects. The only known side effect of CBD is mild sleepiness, which makes chewing up one or two of these delicious gummies before bed a great idea. Top-quality CBD gummies are for sale right here at cbdfx.com. You can choose to have these gummies shipped to any location in the United States. In addition, we’ve partnered with a number of awesome retailers to make our CBD gummy bears even easier to buy. Some CBDFx gummies contain turmeric and spirulina for increased effectiveness. Both of these natural ingredients are “superfoods,” which means that they contain tons of nutrients that you need to stay healthy and happy. Turmeric contains a compound called curcumin, which is an anti-inflammatory and an antioxidant. Curcumin also improves your brain activity and protects against neurological diseases, and this amazing substance may even reduce your risk of heart disease and fight cancer. Spirulina is a type of cyanobacteria, and it contains tons of protein, B vitamins, copper, and iron. Like turmeric, this natural ingredient has antioxidant and anti-inflammatory properties, and it reduces bad cholesterol while supporting healthy blood pressure. Furthermore, spirulina may fight cancer, and it improves your muscle strength. All our CBD products are fully lab tested. While some CBD companies might only lab test their CBD oil, we make sure to test each finished vegan CBD product as well. We test our CBD gummy bears regularly to make sure that we maintain steady production quality, and we post the results of our lab tests online for everyone to see. To make it clear just how much CBD you’re getting in each of our CBD gummy bears, we list the lab results for this vegan CBD product in total milligrams of CBD per gummy bear, milligrams of CBD per gram, and the percentage that CBD makes up in each gummy. Here at CBDFx, we have a strong commitment to transparency, and we want our customers to be fully informed about every aspect of our products. Picking the best CBD gummies on the market isn’t easy. There’s lots of competition out there, and each CBD gummy manufacturer claims to be the best. Not all CBD is made equal. Different manufacturers use different sources of hemp, and they use a variety of processes to extract their CBD. Some of the extraction processes used to make CBD leave dangerous solvents in the finished product, but you can rest assured that we only use solvent-free CO2 extraction to make our CBD oil here at CBDFx. If the hemp that CBD is extracted from isn’t non-GMO and organic, pesticides and other harmful chemicals could end up in the CBD that you eat, drink, or vape. When we extract our CBD, we only use the best organic, non-GMO European hemp because the health of our customers is our top priority. CBD oil can be mixed with a variety of ingredients to make a finished product. If CBD is mixed with unsafe ingredients, however, you could end up accidentally harming yourself in your quest to become healthier. CBDfx gummies only contain safe, natural ingredients. Some of these ingredients include organic tapioca syrup, organic cane sugar, and organic fruit or vegetable juice. Some disreputable CBD companies will try to get away with including low doses of CBD in their products. We’re proud to say that CBDfx scored a 5/5 in an independent quality test conducted by CBD Oil Review, which means we’re rated as being one of the best CBD companies in the industry when it comes to the CBD concentration in our products and overall quality. Before you try a CBD product, make sure to check how many milligrams of CBD it contains. CBD is effective at relatively low doses, but to experience the potential benefits of CBD, you must make sure that the product you’re considering has enough CBD to do the job.